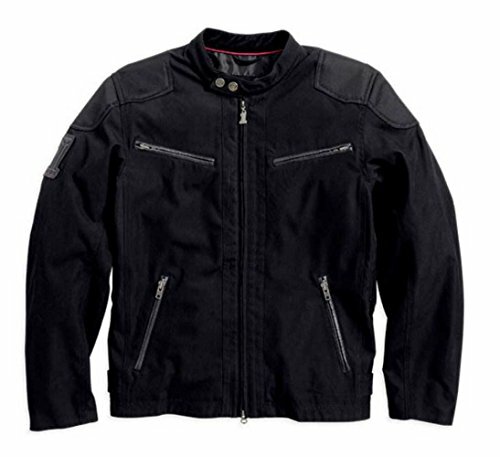 Harley-Davidson® Men's Raven Textile Riding Jacket, 98553-14VM. Performance, functionality, and a rebel attitude come standard in this understated textile motorcycle jacket. Water-resistance keeps you in the saddle even when it gets damp out there. Underarm vents and mesh lining help if the forecast turns steamy. Water-resistant 600 denier 82% polyester, 18% nylon. Polyester mesh and polyester taffeta sleeve lining. Underarm zipper vents. Action back and slightly pre-curved sleeves help position your arms. Body armor pockets at elbows and shoulders. Exterior and interior zipper pockets. Embroidered patch on sleeve and back neck. Slim fit - designed to fit closer to the chest and waist. 98553-14VM.